As the daughter of an Italian farming family, Solfrini grew up eating fresh, local, seasonal foods, but when she moved to New York City to study design, she quickly felt the damaging effects that came with eating a new diet filled with processed foods, too much meat, and too few vegetables. When she returned to Italy, she embraced the seasonal, vegetable-friendly foods of her youth once more, and after eliminating meat from her diet, felt better than ever. Surrounded by the countryside and living on her family's farm, the inspiration to live naturally and healthfully was everywhere and she started her blog to show the world just how fresh, beautiful, and healthful vegetarian Italian cooking could be. 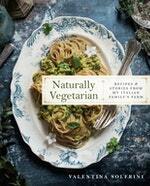 Naturally Vegetarian is an extension of Hortus Cusine, and will be filled with more of Solfrini's arrestingly beautiful photography of rural Italian scenery, authentic tales of Italian farm life and customs through the ages, and more of the delicious vegetarian recipes her fans have come to know and love. Naturally Vegetarian will offer readers a glimpse of a year on an Italian farm and the recipes that come with the changing of the seasons. She also shares how to stock a whole foods Italian pantry, introducing them to new ingredients like chestnut flour, farro, and tomato passata, and the fundamental recipes and techniques for preparing and cooking fresh pasta. Filled with exquisite recipes like Creamy Sunchoke Soup with Golden Onions, Chickpea Crespelle with Spring Vegetable Ragu, Piadina Romagnola with Grilled Vegetables and Tomato Pesto, Pistachio and White Chocolate Tiramisu, and so many more, Naturally Vegetarian is a celebration of Italy's colors, smells, and flavors and will show readers a new side to the traditional Italian kitchen. Love Naturally Vegetarian? Subscribe to Read More to find out about similar books.